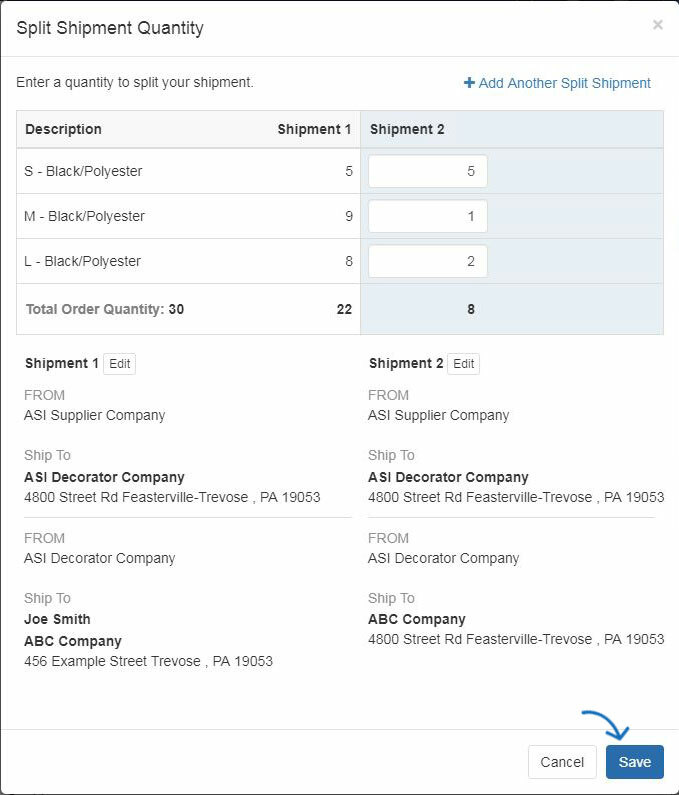 ESP Orders now enables the order to be shipped to multiple addresses! Hover on the product and click on the Edit button. Next, click on the Shipping Tab in the Edit Product window and then click on the Split this Shipment link. A prompt will appear, click on OK if you are ready to set up split shipping. A new window will appear. The Ship From field will be automatically displayed with the supplier’s information. 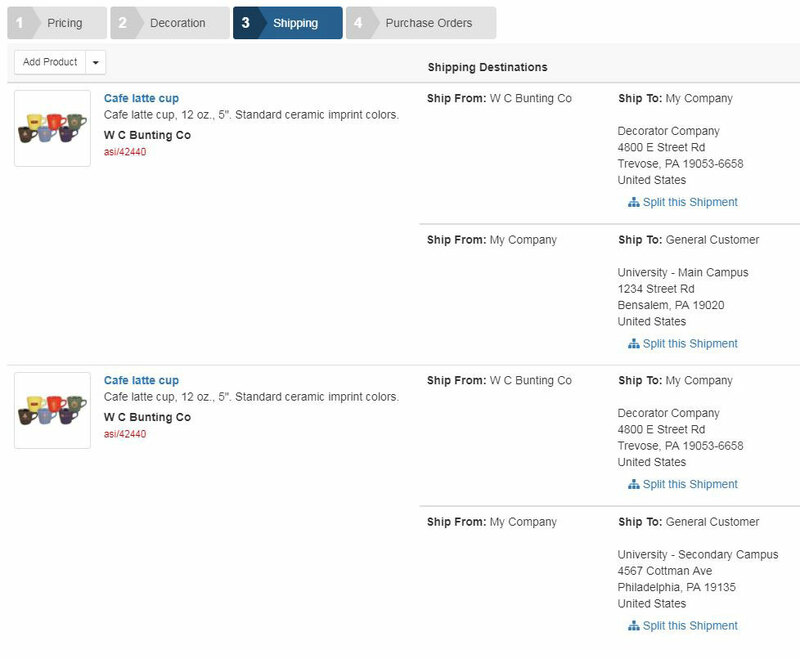 Use the Ship To dropdown to select the second location for the products. Note: The first shipment location will automatically be from the supplier to the main company address of the customer. You will be able to edit the first location’s shipping information in the next step. 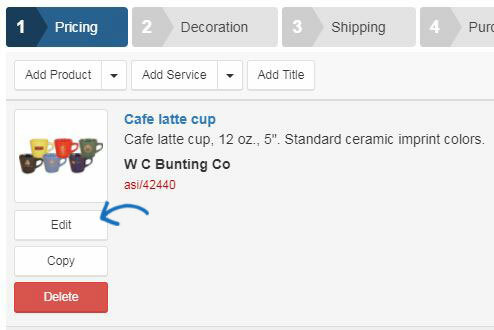 If the contact or address is not already in CRM, use the Add New Contact or Add Shipping Address link to add the information to add a ship to address on the fly. 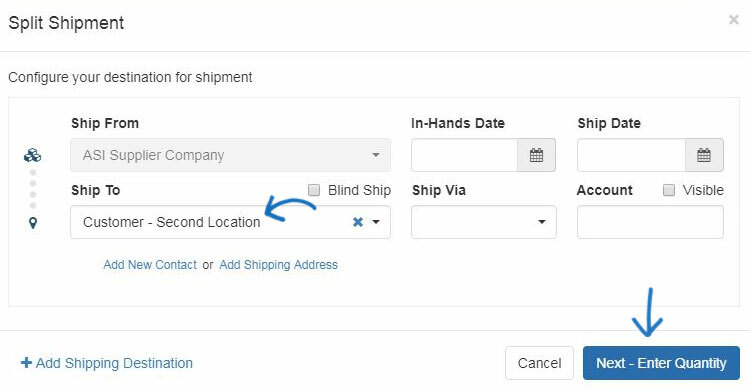 If the shipment should not include any supplier information, check the Blind Ship checkbox. You are also able to enter an In-Hands Date and a Ship Date by clicking on the calendar icon and selecting the date(s). Use the Ship Via dropdown to select the shipping service you would like to use and enter your account information in the Account box. Click on the Next – Enter Quantity button. On the left, a brief description of the product and the total quantity will be displayed. Now, enter the amount of each product which should be sent to each location. If you need change the address details for a shipment, click on the Edit button. If you need to send this order to additional locations, click on the Add Another Split Shipment link. Enter the Ship To information for the additional shipment and then click on the Next – Enter Quantity button. On the main order page, click on the shipping tab to view the split shipment information. After have entered the quantities for your shipments, click on the Save button. 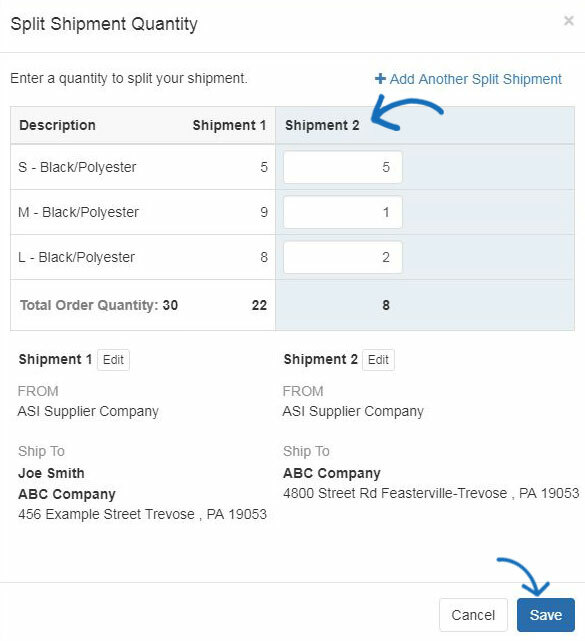 When setting up split shipments, be sure to split the order at the point that you want it to split. 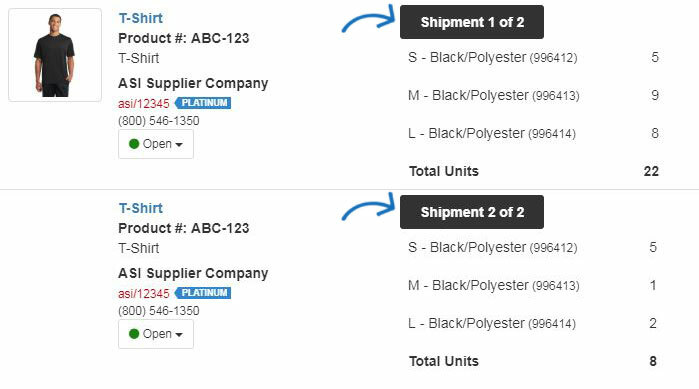 For example, if the shirts are going for decoration, enter the decorator’s information in the Ship To field and then click on the Add Shipping Destination link. A second set of shipping locations will display with the Ship To information from the top as the Ship From information in the second set of information. This means that this order will be shipped from the supplier to decorator and then from the decorator to the end user. 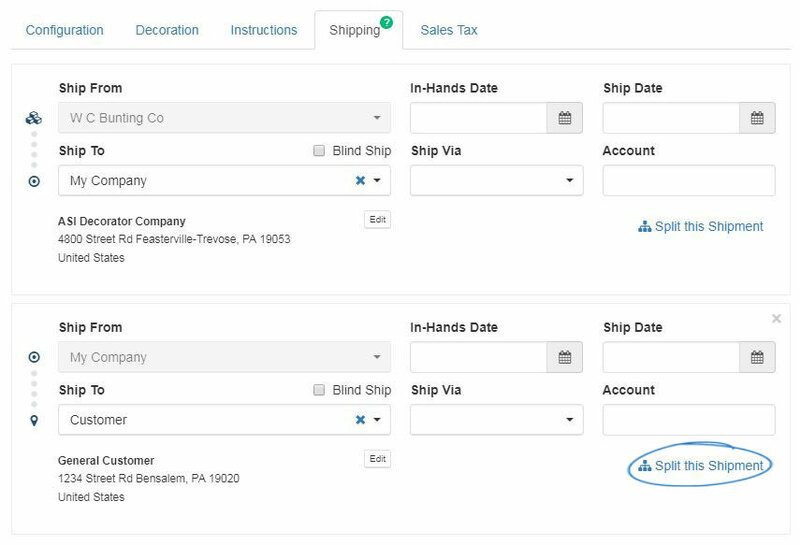 To split the shipment from the decorator to multiple customer addresses, use the Split this Shipment link in the second set of shipping information. Then click on the Next – Enter Quantity button. You will be able to configure the quantities as needed. Click on the Save button when you have finished setting the quantities for each location. In the main Shipping tab on the Order page, you will see both shipping locations for each set location. Each shipping location will have its own listing in this tab.